Immigration, increasing ethnic diversity, and managing the integration of foreigners into host societies are among the most pressing issues of contemporary societal and political debates. Consequently, academic interest in these topics is not only increasing but also spreading across social science disciplines, which hitherto rather neglected these subjects. Numerous studies focus on how receiving countries address and react to immigration, for instance, by studying migration policies such as immigration, integration policies, or natives’ attitudes towards immigrants. Much less is known about immigrants’1 attitudes towards the host country or society and how these attitudes are affected by the political and societal receiving context to which immigrants are exposed. Existing research suggests that national identity, in the sense of a feeling of attachment to a country, can assume the role of an overarching identity that reduces social distances between distinct groups in a society, diminishing social conflicts and contributing to social cohesion (Transue 2007; Verkuyten and Martinovic 2012). Given the potential role of national identity as a “social lubricant” (Miller 1995; Reeskens and Wright 2014), the purpose of this study is thus to examine the factors that enhance immigrants’ feelings towards their new country of residence in terms of national identification. More specifically, we are interested in how cantonal norms of inclusion or exclusion affect immigrants’ national identity in terms of their feelings of attachment to Switzerland. Our main focus will be on the crystallization of these norms in cantonal integration policies. Alternative measures to capture the degree of cantonal exclusivity or inclusivity towards immigrants include, first, popular attitudes towards immigrants aggregated at the cantonal level and, second, cantonal vote shares of conservative right parties. Research on integration, immigration and citizenship policy is abundant. Whether qualitative or quantitative in orientation, the predominant approach of these studies is based on cross-country comparisons of national policies (e.g., Brubaker 1992; Bjerre et al. 2015; Favell 2001; Goodman 2010; Koopmans et al. 2012). This narrow, nation-state focus is increasingly criticized (Castles 2010) by scholars emphasizing striking policy differences (e.g., between Italian regions or Swiss cantons) and by bustling integration policymaking activities (e.g., in the US states) at the subnational level (Condon et al. 2016; Manatschal 2012; Wisthaler 2016). Subnational policy heterogeneity creates different living conditions for immigrants and, therefore, a non-negligible heterogeneity in integration possibilities (Cattacin and Kaya 2001). A large number of studies focus further on determinants of integration policies such as immigration history, meaning path-dependency (Favell 2001), or the influence of far-right parties (Koopmans et al. 2012). However, few studies analyse integration policy outcomes. For instance, Cebolla-Boado and Finotelli (2011) evaluate the effect of integration policies on labour market integration, and Manatschal and Stadelmann-Steffen (2013) scrutinize policy outcomes on immigrant educational inequality across cantons. Our study addresses the two gaps identified above: First, we try to understand the effect of integration policies on immigrants from a thus far neglected perspective, their feelings of national attachment. Second, by focussing on cantonal integration policy, the study complements the emerging body of research emphasizing the relevance of subnational integration policy heterogeneity. In addition to cantonal integration policy, we also account for the potential effects of societal norms on immigrants’ national identification in terms of majority attitudes towards immigrants. Several scholars scrutinize the different determinants of public attitudes towards immigrants (e.g., xenophobia), investigating, for instance, the effect of the type of the welfare state (Koopmans 2010) or the effect of news media (Boomgaarden and Vliegenthart 2009). Similarly to the research on integration policy, outcome studies focussing on how inclusionary or exclusionary popular attitudes affect immigrants’ attitudes or behaviour in turn remain scarce. Only a handful of studies aim at analysing the outcomes of natives’ attitudes on non-citizens’ location choices (Slotwinski and Stutzer 2015), return migration (de Coulon et al. 2016) or labour market discrimination (Waisman and Larsen 2007). Our study adds to this research because we are interested in the more immediate effect of welcoming or hostile attitudes towards immigrants on non-citizens’ sense of national identity. Beyond these specific contributions to the literature, this chapter also speaks directly to the Migration-Mobility Nexus standing at the core of this edited volume (see Chap. 1). First, the study follows the sedentary premises of classical migration research when focussing on how societal norms affect immigrants’ integration outcomes (Castles 2010; Dahinden 2016). Second, mobility scholars argue that governance of migration and mobility occurs at subnational, national or supra-national levels. By focussing on the subnational policy level, this study circumvents the narrow focus on the nation-state, which is predominant in classical migration studies (Wimmer and Glick-Schiller 2006). Third, this chapter also contributes to this nexus by questioning what makes immigrants feel attached to their host country. This emotional connection is likely to be related to higher intentions to remain in Switzerland rather than to leave again. In this sense, the findings of this study can also help to better understand potential drivers of individual (im-)mobility trajectories. This study builds on different data sources. The main data source is the Migration-Mobility Survey conducted in 2016, from which we draw our dependent variable, immigrants’ feelings of attachment to Switzerland. This survey clearly surpasses other population surveys in Switzerland because it is the only comprehensive and nationally representative survey focussing explicitly on immigrants. The survey is conducted in six different languages, which also guarantees the inclusion of non-language-assimilated immigrants. Even more importantly for the present study, the large sample of 5973 immigrant respondents facilitates individual analyses at the level of the Swiss cantons, which is hardly feasible with general population surveys. To measure cantonal integration policies, we draw on data collected by Manatschal (2011). Public attitudes towards immigrants at the cantonal level, in turn, will be captured by direct democratic vote results (e.g., the national vote on “mass immigration” from 2014), which are less distorted by social desirability than are survey data on xenophobia, and cantonal statistics on conservative-right voting rates. To empirically test the relationship between societal norms at the cantonal level and immigrants’ individual national identities, we apply multilevel regressions suitable for cross-sectional analyses of this type, accounting for the pertinent individual and cantonal control variables discussed in the literature. This chapter is organized as follows. Section 8.2 discusses the current state of the research and develops theoretical hypotheses concerning the assumed relationship between inclusionary/exclusionary societal norms and the national identification of immigrants in Switzerland. Section 8.3 presents the data sources and explains the research design and methods used in this study. The results of our multilevel regression analyses are presented in Sect. 8.4. Section 8.5 concludes. National identity can be understood as an “awareness of affiliation with the nation” (Hjerm 1998, p. 337) that increases the possibility to “feel at home” (Keane 1994). “National identity” relates to a broader lexical field in the literature, with scholars using different terms such as “host-country identity” or “majority identity” to refer to the same concept. Although we use the term “national identity” in this chapter, it can be understood as a synonym for the abovementioned terms. In surveys, national identification is typically measured with questions such as “how close do you feel to country XY?” This understanding of national identification as closeness or affiliation with a country can be demarcated from two other forms of positive perceptions of the nation. First, patriotism implies pride in the nation, e.g., in national democratic institutions. Second, nationalism reflects an uncritical and blind attachment to the nation, which is often combined with a sense of national superiority with respect to other countries (Coenders et al. 2004; Green et al. 2011). National identity, in turn, can decrease social distance between distinct subgroups sharing the same overarching identity and, thus, diminish intergroup conflicts because individuals with distinct religious, ethnic, or home country-related identities can continue to reunite under the same overarching identity (Transue 2007). Identification with the country one lives in, meaning national identification, can take over the role of such an overarching identity. Given its role as a social lubricant (Miller 1995; Reeskens and Wright 2014), national identification by immigrants can be a remedy for social problems resulting from ethnic diversity. Indeed, immigrants’ attachment to the host-country identity helps to reduce intergroup conflict via two main mechanisms. First, national identification among immigrants decreases social distance from the majority group by embracing, partly or entirely, the overarching identity (Gaertner et al. 1989). Second, negative feelings across minority groups can also shrink due to host-country identification because that identification unites a plethora of subgroup identities under an encompassing identity (Transue 2007; Verkuyten and Martinovic 2012). More generally, trust and solidarity develop more easily between individuals sharing common values related to the same identity (Doosje et al. 1999). In summary, this type of a shared overarching identity, which can be approximated by national identification, can be a solution to tensions arising from ethnically diverse societies because national identification creates a common sense of belonging (Moran 2011; Transue 2007), reduces social distance between states’ residents and helps to develop national solidarity (Kymlicka 2015). Because of its beneficial effects on social cohesion, scrutinizing more closely the feeling of attachment to the host country appears highly relevant for contemporary states facing growing ethnic diversity. The first contribution of our chapter to the existing research is thus that we try to understand the effect of welcoming or hostile reception contexts on immigrants from a thus far neglected perspective, their feelings of national attachment. A broad range of research examines the interplay between host and origin country identities. Traditionally, and in contrast to the idea of the overarching identity delineated above, scholars have depicted dual identity as impossible, meaning that identification with a specific ethnic identity is inversely related to identification with other subgroups (Verkuyten and Martinovic 2012; Gecas and Burke 1995; Hall and du Gay 1996; Simon 1997). More-recent research contradicts these earlier findings, claiming that, in reality, identities are not exclusive but rather overlapping and overarching (Bauböck 2002). For instance, support for this argument is provided by the increasing acceptance of dual citizenship attribution in many European countries (Blatter 2011; Vink and Bauböck 2013). Phalet and Swyngedouw (2002) examine the long-distance affiliation sustained by Turk and Moroccan communities in Belgium with their homelands through transnational identities. Based on this empirical evidence, the authors develop a composite understanding of identities in the context of a contemporary European state. Nandi and Platt (2015) study minorities in the UK, showing how three different identity levels (ethnic, regional and national) interact with one another. They emphasize that groups are not homogeneous in terms of identities, which can be composed of different affiliations. Based on the interaction of different identities, Verkuyten and Martinovic (2012) delineate a four-field typology of possible identity configurations: First, assimilation occurs when immigrants favour the host-country identity over the ethnic identity of the country of origin. Immigrants maintaining both identities as salient represent cases of integration or dual-identity, whereas a major support for the ethnic identity implies separation. Marginalization describes individuals without any specific attachment to either of the countries. These studies show that identities are not fixed and unique but rather are fluid and hyphenated. A variety of individual factors determines the national identification process. Being able to speak the local language and being citizen of a country (Maxwell 2010) are all factors that are positively associated with the national identification of immigrant minorities with the host land. Concerning duration of stay in the host country, assimilation theory (Alba and Nee 2009) stipulates that, with time, immigrants’ identities converge towards national identification with the destination country. Some studies confirm this theory, finding that the length of time since immigrants’ arrival is positively correlated with national identity (Manning and Roy 2010; Nandi and Platt 2015; Platt 2014). However, other scholars find that the correlation between length of stay and host-country identity is U-shaped (Reeskens and Wright 2014), implying that recently arrived and long-time resident immigrants are the most attached to their host country. In addition, Reeskens and Wright (2014) find that a higher level of education coincides with less national group identification because highly educated individuals tend to have more cosmopolitan and transnational identities. However, this finding is partly weakened by studies considering the interplay between education and national identification (e.g., Verkuyten and Martinovic 2012). On the one hand, highly educated individuals tend to have more contacts with nationals, which increases overarching group identification; on the other hand, highly educated individuals are also more likely to notice discrimination towards themselves or, more generally, their subgroup. According to the literature, the receiving context matters for immigrants’ national identification in three respects: immigrants’ perceived discrimination, natives’ anti-immigrant attitudes and an ethnic conception of the nation. There is a negative relationship between perceived discrimination and minorities’ national identity (Jasinskaja-Lahti et al. 2009; Maxwell 2010; Verkuyten and Martinovic 2012). Indeed, “perceived discrimination prevents minority members from developing a sense of belonging to an overarching national in-group” (Jasinskaja-Lahti et al. 2009, p. 109). As Maxwell (2010) summarizes, discrimination appears to be more justified in a context in which anti-immigrant feelings are widespread (Fetzer 2000; Joppke 2005; Paskeviciute, A., & Anderson. C. (2008). Friendly Territory: Opinion Climate, Discontent, and Immigrant Political Action in Europe. Paper presented at the American Political Science Association conference, Boston MA, August 28–31). In addition, natives’ xenophobic attitudes undermine the inclusion of immigrants as a legitimate part of the society (Koopmans et al. 2005; Banting and Kymlicka 2006; Maxwell 2010), which can directly hamper immigrants’ attachment to the host country. Moreover, Hjerm (1998) suggests that there is a positive association between xenophobic attitudes and an ethnic conception of national identity among the majority group. Not surprisingly, such a national identity based on ethnic principles leads to a greater gap in national group identification between majorities and minorities, with natives identifying more strongly with the nation than, for instance, immigrant minorities (Staerklé et al. 2010). Ultimately, natives’ anti-immigrant feelings are more likely to develop when an ethnic conception of national identity prevails, which in turn paves the way for justifying discrimination. This interplay of factors suggests that the reception environment of immigrants in the host country in terms of hostile/welcoming native attitudes is relevant to immigrants’ feelings of national identity. Few studies scrutinize the role of institutional settings, such as multiculturalist, integration and citizenship policies, with respect to the host-country identification of immigrants. Outcomes of these different manifestations of migration policy can be studied through two theoretical lenses. First, an instrumental-legalistic perspective, based on the economic rational-choice model, stipulates that individuals react to institutional rules defined by migration policies based on a purely rational cost-benefit calculation (Van Hook et al. 2006). For instance, according to this logic, a non-citizen would move from the canton of Nidwald to Zurich because access to naturalization is comparatively easier in Zurich. Because our study does not relate to material benefits but rather to the receiving political context in terms of atmosphere, we follow a second theoretical approach instead, which highlights policies’ “symbolic boundaries” (Lamont and Molnár 2002). The national self-understanding of a state defines who belongs to a community, who does not (meaning the boundaries of nation states), and consequently the reception environment of a given territory (Koopmans et al. 2005). Van Hook et al. (2006) describe the importance of feeling welcomed at arrival to understand, for instance, naturalization intentions. Therefore, by giving a “warm handshake” or a “cold shoulder” (Reeskens and Wright 2014) to immigrants, the country’s discursive opportunity structure (Koopmans et al. 2005) leads immigrants to construct an “emotive understanding of membership” (Bloemraad 2013, p. 201) generated by governments. The literature discusses different political institutions as important drivers of national identification, such as multiculturalist policies (Wright and Bloemraad 2012), access to citizenship (Ersanilli and Koopmans 2010) and integration policies (Dinesen and Hooghe 2010), without however reaching unanimous conclusions, as we further elaborate upon below. Drawing on the notion that national self-understanding and reception environments crystallize in territories’ integration policies (Koopmans et al. 2005, p. 6), the chapter transfers this approach to the subnational level. This chapter addresses the puzzle of how the subnational reception environment, measured amongst others through cantonal integration policies, affects the feeling of attachment to the host country. As mentioned above, the literature finds consensus on the negative correlation between hostile natives’ attitudes towards immigration and immigrants’ identification with an overarching identity. However, mixed findings emerge when scholars address the effects of inclusive or exclusive integration policies. Some studies find no effect of inclusionary policies on national identification (Hjerm 1998; Dinesen and Hooghe 2010; Wright and Bloemraad 2012). Contradicting these results, more-accessible citizenship policies yield positive effects on minorities’ identification with the host country according to Ersanilli and Koopmans (2010). Multiculturalism and citizenship policies have attracted great attention from scholars. At the same time, little is known about the precise role of more-comprehensive integration policies. Only two papers address this specific type of policy (Dinesen and Hooghe 2010; Reeskens and Wright 2014), and these studies do not find any effect of integration policies on the feeling of attachment to the host country. One major limitation of these studies is that they focus unanimously on national policies, which might not be the most adequate analytical level when investigating interpersonal relationships or personal attitudes (Gundelach and Manatschal 2017; Kesler and Bloemraad 2010). National identification is an individual attitude that develops when exposed to local, regional, and national discourses and policies. Given that individuals’ everyday lives are more or less closely tied to the specific locality and canton in which they live, we can assume that the regional reception and integration policy environment is decisive in shaping an individual’s national identification. The second contribution of this chapter, therefore, concerns the political unit under study. Complementing the abovementioned studies addressing receiving contexts and national identification exclusively at the national level, this paper scrutinizes the pronounced but often neglected subnational integration policy heterogeneity and how that heterogeneity affects the national identification of noncitizens in Switzerland. Thus, this paper adds to the recently emerging literature on subnational integration policy outcomes (e.g., Condon et al. 2016; Gundelach and Manatschal 2017; Manatschal and Stadelmann-Steffen 2013). Based on the theoretical reflections delineated above, our first hypothesis stipulates that national attachment of immigrants increases in regions with more-inclusive cantonal reception contexts in terms of integration policy and popular attitudes. With the exception of integration policy, this hypothesis is in line with the results reported in other policy fields (e.g., naturalization and multiculturalism) on how such reception contexts affect national identification. Drawing on the “assimilation theory” argument, according to which identification with an overarching identity emerges only after a certain period of time (Alba and Nee 2009; Manning and Roy 2010; Nandi and Platt 2015; Platt 2014), we deem it necessary to further refine the positive relationship stipulated in hypothesis one. Reception contexts might not have an immediate effect on national identification but rather act as a catalyst. Our second hypothesis, therefore, postulates that inclusive cantonal reception contexts in terms of integration policy and popular attitudes amplify the positive effect of duration of stay on immigrants’ national identification. We refrain from formulating explicit hypotheses concerning the homeland identification of immigrants. As the literature suggests, all possible combinations of home- and host-land identification occur in reality (Verkuyten and Martinovic 2012). In other words, an increase in host-land identification does not necessarily imply a decrease in homeland identification. We will nevertheless complement our main analyses on national identification and test, in an exploratory manner, how cantonal reception contexts in terms of cantonal integration policies or popular attitudes affect immigrants’ homeland identification. To empirically test our theoretical expectations, our research builds on three data sources. The dependent variable, immigrants’ feelings of attachment to Switzerland, is drawn from the Migration-Mobility Survey conducted in 2016. This survey clearly surpasses other population surveys in Switzerland because it is the only comprehensive and nationally representative survey focussing explicitly on immigrants that is conducted in six different languages, which also guarantees the inclusion of non-language-assimilated immigrants. Even more importantly for the present study, the large sample of 5855 non-citizen respondents available for our particular analyses guarantees sufficient respondents at the level of the individual cantons. Consequently, the survey allows for individual analyses at the cantonal level, which is hardly feasible with general population surveys. To measure cantonal integration policies, we draw on data collected by Manatschal (2011). Public attitudes towards immigrants at the cantonal level, in turn, are preferably captured by cantonal statistics on right-wing voting rates or direct democratic vote results (more specifically, the vote against “mass immigration”2 from 2014), which are less distorted by social desirability than are survey data on xenophobia. To measure our main dependent variable, immigrants’ feelings of attachment to Switzerland, we use an item from the Migration-Mobility Survey in which respondents had to answer the following statement: “On a scale from 0 (no feeling of attachment) to 7 (strong feeling of attachment), to what extent do you have a feeling of attachment to Switzerland?” This eight-point scale item can be used as a fine-grained continuous factor. Promisingly, only a very low number of missing answers (23) is listed, leaving us with a sample of 5855 respondents for our analyses. As the left-skewed distribution in Fig. 8.1 shows, the sample under scrutiny tends to feel rather attached to Switzerland. Fewer than 3% of all respondents indicated that they do not feel attached to Switzerland at all (0), whereas approximately 20% expressed a strong feeling of attachment (7). More than 60% of the questioned individuals ranged their attachment between 4 and 6, whereas only 17.4% indicated a relatively low attachment to Switzerland, ranging from 1 to 3. Cantonal integration policies serve as the main independent variable in this study. We measure cantonal integration policy using an index built by Manatschal (2011). Conceptually, this index captures subnational integration policies along different policy dimensions that measure the ease or difficulty of accessing civic, political, socio-structural, as well as cultural and religious rights and obligations based on 24 indicators overall. 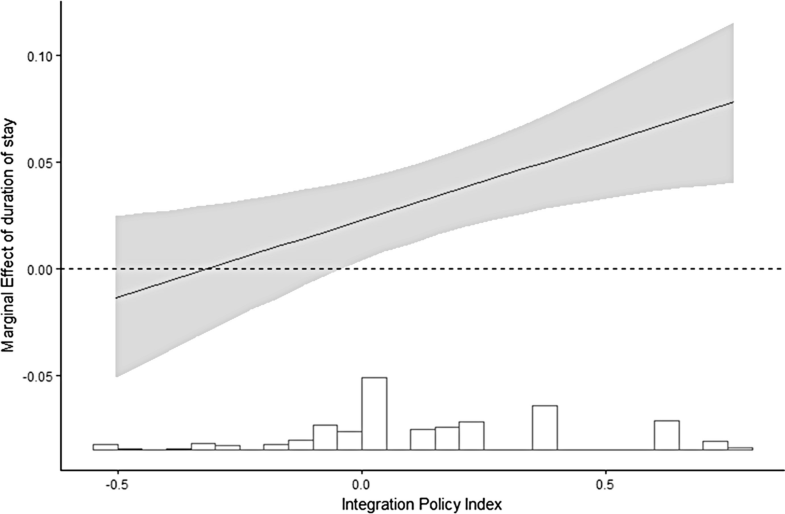 The overall additive Integration Policy Index (IPI) is a continuous variable ranking from −0.54 (most restrictive policy pole) to 0.76 (most inclusive policy pole; for a detailed discussion see Manatschal 2011; Manatschal and Stadelmann-Steffen 2013). The index reveals a clear divide along Switzerland’s language regions, as shown in Fig. 8.2. French-speaking cantons have in general more-inclusive integration policies than do German-speaking cantons, with the canton of Ticino lying in between. This linguistic policy pattern reflects a cultural-historical coinage, with French-speaking cantons being influenced by France’s more inclusive jus soli citizenship conception and German-speaking cantons (and Ticino) reflecting Germany’s (and Italy’s) traditionally more-restrictive jus sanguinis citizenship tradition (Manatschal 2012). In line with the literature documenting the path dependency of national integration regimes (Brubaker 1992; Favell 2001), cantonal integration policies reflect path dependent, meaning fairly stable, policy frameworks over time (Manatschal 2012; similar findings are reported in Sager and Thomann 2017 for the related policy field of cantonal asylum policy). We also, however, consider testing more recent cantonal policy data. Currently, there is no more-recent comprehensive cantonal integration policy measure available, but there is an index for the single policy field of naturalization policy (Arrighi and Piccoli 2018), which we will use as an alternative cantonal policy measure in this study. In addition to cantonal integration policy, we use alternative measures that capture the degree of cantonal exclusivity or inclusivity towards immigrants. First, popular attitudes towards immigrants aggregated at the cantonal level (measured in terms of cantonal yes-shares to the national vote against “mass immigration” from 2014) capture the cantonal reception environment. Second, the most recent federal elections in 2015 are used to extract cantonal vote shares of conservative right parties based on the following parties: Swiss People’s Party (SVP), the League of Ticino, the Citizens Movement of Geneva, the Swiss Democrats and the Federal Democratic Union (Strijbis 2014). We gathered additional contextual variables at the cantonal level to control for other influencing factors. The unemployment rate for foreigners and the GDP per capita grasp the economic realities of the cantons. The geographic context is approximated by the cantonal degree of urbanity. The foreign-born share reflects the ethnic diversity in each canton. To account for the cultural-linguistic heterogeneity in Switzerland, a dummy variable is included to control for the majority language in a canton (1 = German-speaking, 0 = otherwise). In addition to these contextual factors, we control for the following variables at the individual level. We gather socio-demographic factors such as age, gender and duration of stay in Switzerland (in years). The question of education has been recoded to obtain a grading from the primary to the tertiary level. Another aspect that is relevant to the feeling of attachment is the ability to speak the local language. Therefore, a six-point scale question assessing individual language skills is included in the analysis. The type of residence permit also matters for this study because it creates different living conditions for non-citizens. The remaining variables address daily life experiences in Switzerland, which likely affect respondents’ feelings of attachment to the country. An eleven-point scale question describes respondents’ general satisfaction with their decision to move to Switzerland. In addition, a dummy variable is used to measure whether the respondent felt discriminated against in the last 2 years due to his/her origin. Having a social network primarily in Switzerland or in the home country can have divergent effects on the feeling of attachment. Consequently, a five-point scale question is included in our analysis identifying the geographical location of a respondent’s social network from “all good friends live in Switzerland” (1) to “all good friends live abroad” (5). More details on all of the variables, data sources, operationalization of the single variables and descriptive statistics can be found in Table 8.2 in the Appendix. Given the hierarchical structure of the data, we apply a multilevel analysis3 (random intercept models for the baseline model and random slopes and intercepts for the interaction model), implying that individual behaviour can vary between cantons. Cantons represent level-2 units, and individual observations nested within the 26 cantons are the level-1 units. Such multilevel models are moreover very useful if the number of respondents per canton is low because the level-1 estimators are not only rooted in the observations of a particular contextual unit but also ‘borrow strength’ from the other level-2 units (Steenbergen and Jones 2002). Additionally, these models allow for the modelling of macro-level characteristics (in the present case, the cantonal integration policy and the additional cantonal control variables). Table 8.1 shows the results of the baseline model. Model 1 confirms that the correlations at the individual level are in line with some of our expectations. Age is positively correlated with the dependent variable. Surprisingly, duration of stay is negatively correlated with the feelings of attachment to Switzerland without being statistically significant. Educational attainment is also not significantly correlated with the outcome. Concerning residence permit, compared with the reference category of Permit C (also called “settlement permit”), Permit B (a residence permit valid for one [non-EU/EFTA] or 5 years [EU/EFTA]) appears to increase feelings of attachment. Interestingly, even non-citizens with the L Permit, a shorter residence permit allowing a year of stay maximum, feel more strongly attached to Switzerland than do members of the reference category. Diplomats, civil servants and their family members (the latter holding a Ci permit) express no greater feelings of attachment to Switzerland than do those with the regular C permit. However, the residence permit estimates are not statistically significant. As expected, individuals who are satisfied with their life in Switzerland and who speak the language fluently tend to feel more strongly attached to the host country. Similarly, if a person has experienced discrimination in the last 2 years, her/his feeling of attachment is significantly reduced. Social networks also matter because immigrants who have all their good friends abroad exhibit significantly lower levels of national identification compared with those with important social ties in Switzerland. Source: Migration-Mobility Survey 2016. Weighted results. The contextual variables “Urbanity”, “GDP p.c.”, “German-speaking canton”, “Yes share of “mass immigration” vote”, “Conservative right” have been made available by the Swiss Federal Statistical Office (SFSO) and “Foreigners’ unemployment rate” by the SECO. Concerning the cantonal variables, interestingly, none of them significantly affects non-citizens’ attachment to Switzerland. With respect to the cantonal reception environment, the direct democratic vote variable (i.e., the yes-share to the “mass immigration initiative”, with higher shares representing more-immigrant-hostile attitudes) and the conservative right share do not appear to have any direct effect on immigrants’ feelings of attachment. Cantonal integration policy points in the expected positive direction; however, this result is not statistically significant. Thus, we find no support for our first hypothesis. Given that there is no direct effect of cantonal reception contexts on immigrants’ national identity, we turn to our second hypothesis and test whether cantonal reception contexts instead have a catalytic function. For instance, Model 1 in Table 8.1 does not account for effective reception context exposure. Thus, this model might not adequately capture the potential policy or public attitude effects. The Migration-Mobility Survey does not include any direct item capturing individuals’ perceptions of the cantonal reception context as inclusive or exclusive. Instead, Model 2 in Table 8.1 does indirectly model context exposure for the cantonal integration policy factor by introducing a cross-level interaction term between immigrants’ duration of stay and the cantonal Integration Policy Index. As expected, the interaction term is significantly positive. In other words, the positive effect of length of stay on immigrants’ feelings of attachment is significantly stronger in cantons with more-inclusive integration policies, which corroborates our more nuanced second hypothesis. This finding suggests that effective exposure to cantonal policies is required for the expected positive effect of inclusive cantonal integration policy on attachment to unfold. Models 3 and 4 in Table 8.1 display the interaction terms between duration of stay and our two additional measures of cantonal reception contexts capturing natives’ attitudes towards immigrants. The results are generally consistent with those shown in Models 1 and 2. Concerning the interaction terms with natives’ attitudes, only Model 4 displays a slightly negative and statistically significant result. In line with our second hypothesis, the positive effect of duration of stay on attachment to Switzerland is amplified in inclusive cantons, meaning those with lower yes shares of the “mass immigration” vote. Figure 8.3 illustrates the policy interaction effect with a marginal effect plot that helps to better determine how the two independent variables jointly alter non-citizens’ feelings of attachment to Switzerland (Berry et al. 2012; Brambor et al. 2006). The marginal effect of time spent in Switzerland on immigrants’ feelings of attachment is insignificant when the IPI is at its lowest value. The increasing slope illustrates how the marginal effect on attachment to Switzerland turns significantly positive in more-inclusive cantonal integration policy contexts. In other words, Fig. 8.3 shows that the positive effect of length of stay on attachment to Switzerland observed in Table 8.1 increases even further in cantons with increasingly liberal integration policies. The same pattern appears in Figs. 8.4 and 8.5, which are based on Models 3 and 4 in Table 8.1. Despite the insignificance of the interaction term per se, Fig. 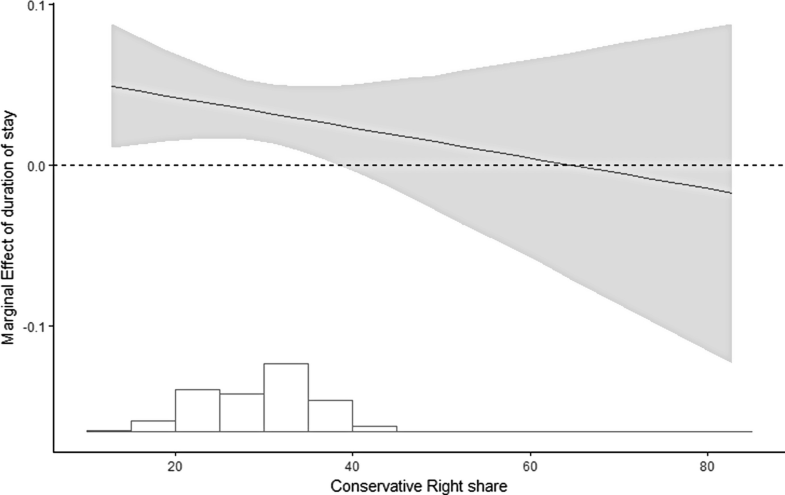 8.4 shows that up to a conservative right share of 37.1%, which represents a substantial share of 75% of all of the cantons, the interaction term is statistically significant and slightly negative. 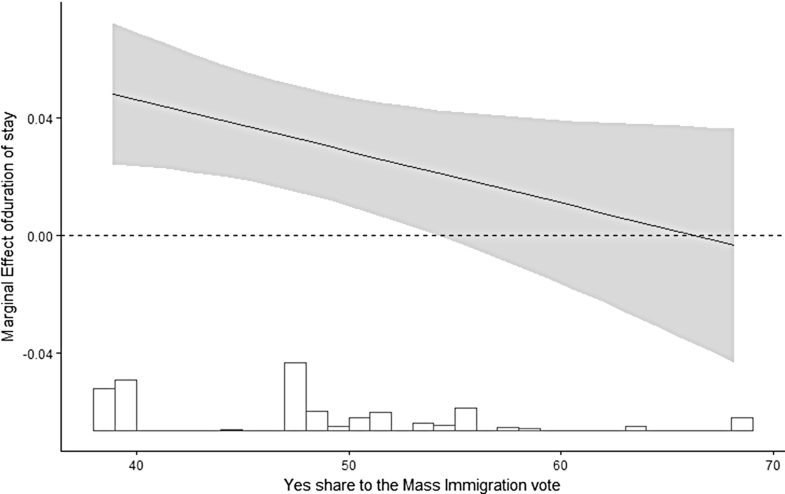 Concerning integration policies, more-welcoming native attitudes towards immigration (in terms of a lower vote share for the conservative right) appear to amplify the positive effect of length of stay on attachment to Switzerland. The catalyst role of the cantonal reception context is also observable in Fig. 8.5, which follows the same trend as Fig. 8.4. Overall, these results confirm our second hypothesis that more-inclusive/welcoming political contexts act as catalysts by amplifying the positive effect of time spent in Switzerland on immigrants’ national attachment. We conducted several robustness checks that support the main results of our analyses. Because the strongest results emerge from the interaction between period of residence and IPI, these checks will focus on the reception context in terms of integration policy. First, we tested the models with another dependent variable, feelings of attachment to the country of origin (Table 8.3 in the Appendix). In line with the theoretical expectations, respondents with all of their good friends abroad accordingly feel closer to their country of origin than do immigrants who have strong social ties in Switzerland. Non-citizens with no local language knowledge feel more strongly bound to their homeland than do individuals who have better language abilities. Lower satisfaction with the decision to move to Switzerland is further correlated with a stronger feeling of attachment to the country of origin. These last three variables follow a trend opposite to that observed in our main models, indicating clear individual differences between host- and homeland attachments among non-citizens in Switzerland. In contrast to the dependent variable, feelings of attachment to Switzerland, one could expect that inclusive cantonal integration policies coincide with a lower feeling of attachment to the homeland. However, cantonal integration policy is never statistically significant even when interacted with duration of stay in Switzerland. Thus, more-inclusive integration policies do not appear to sway immigrants’ feelings away from their country of origin. The second robustness check used the Citizenship Index (CI) (Arrighi and Piccoli 2018) instead of the Integration Policy Index to measure cantonal policy contexts (Table 8.4 in the Appendix). Before its inclusion in the models, the CI was z-transformed to make it as comparable as possible to the IPI. The two indices are weakly but significantly correlated at 0.40 (Pearson’s correlation, p < .05). The CI ranks the Swiss cantons according to the ease or difficulty with which non-citizens can access ordinary naturalization. Model 1 in Table 8.4 shows a statistically significant negative correlation between CI and feelings of attachment. The interaction term in Model 2 in Table 8.4 does not reveal the same positive trend observed in Model 2 in Table 8.1. Indeed, the CI does not act as a positive catalyst by amplifying the positive effect of duration of stay on immigrants’ feelings of attachment to Switzerland. Third, to test the catalyst-function of inclusive integration policy with other determinants of national identification, we checked additional interaction terms between the IPI and both educational attainment and satisfaction with the decision to move to Switzerland (Table 8.5 in the Appendix). Only individuals with a secondary education display a statistically significant and positive estimate when interacted with integration policies. Fourth, to account for individual integration into the labour market, a dummy variable (1 = employed, 0 = unemployed) was created (Table 8.6 in the Appendix). Model 1 in Table 8.5 contrasts with our main results because of the negative effect of integration policies on feelings of attachment to Switzerland. However and in line with our main results, the IPI is positively correlated with the outcome variable when interacted with duration of stay in Model 2 in Table 8.6. Interestingly, the R2 of this model is greater than the one drawn from our main analyses, although the inclusion of this new variable leads to approximately 2000 missing observations. This chapter set out to answer the question of how the reception context in Swiss cantons affects immigrants’ national identity in terms of feelings of attachment to their destination country. To understand the reception context in Swiss cantons, we considered different manifestations of societal norms of inclusion or exclusion in the Swiss cantons as reflected in cantonal integration policies, public attitudes towards immigrants, and conservative-right vote shares. As the research discussed in this chapter clearly shows, the identity question is complex. Identities are not fixed and unique but fluid and overlapping. This complexity is most likely best captured by the notion that identity equals the sum of all the different attributes and affiliations that make a person unique and that help identify this particular person and no one else out of all possible people (Maalouf 1998, p. 16). Despite this complexity with respect to the identity question, the chapter shows that it can be very revealing to isolate and scrutinize a single aspect of identity among specific individuals, such as immigrants’ national identification with their country of residence. This aspect can play an important role as an overarching identity by uniting groups that can have very different ethnic, religious, or cultural identities, as is often true in immigration societies. Despite its integrative force as a “social lubricant” (Miller 1995; Reeskens and Wright 2014) that can bring different people together, diminish social distances, and contribute to social cohesion and mutual trust, we know surprisingly little about whether the reception context can nurture national identification among immigrants. 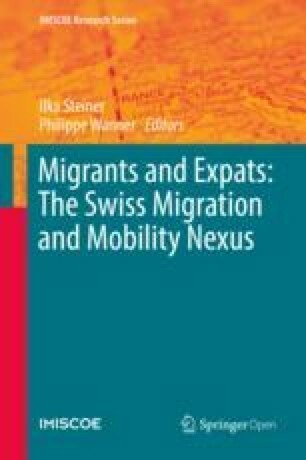 This chapter offers important contributions to the existing research by addressing the neglected question of how reception contexts at the level of Swiss cantons, which represent the immediate everyday life context individuals are exposed to and within which feelings of attachment to the country of residence evolve, affect immigrants’ national identity. From a merely descriptive perspective, non-citizens indicate an overall high attachment to Switzerland. Corroborating assimilation theory (Alba and Nee 2009), the results of our multilevel analyses show that with time in terms of older age immigrants’ national identification with Switzerland increases. Further in line with the theoretical expectations, immigrants’ national identification increases with higher levels of satisfaction with their decision to move to Switzerland, language ability, and their close social networks being primarily located in Switzerland. Finally, immigrants who have experienced discrimination based on their country of origin over the past 2 years expressed significantly lower levels of national identification. This last individual finding is particularly relevant for our study; it relates individual experiences to the larger reception context, which is the focus of our chapter, showing that an exclusive social reception context does indeed impair individual attitudes towards the destination country. However, at the contextual level of Swiss cantons, we observe no direct effect of the reception context on immigrants’ national identity. Neither cantonal integration policy nor immigrant-sceptic attitudes as expressed in vote results or conservative-right vote shares are per se significantly related to non-citizens’ attitudes towards Switzerland. As we argue in this chapter, the reception context might not yield a direct effect on individuals but rather might affect immigrants’ national identification in an indirect (i.e., catalytic) way. As the results of our cross-level interaction models suggest, an inclusive reception context in terms of liberal cantonal integration policies and, although to a weaker extent, less xenophobic attitudes and a low share of conservative-right parties amplify the positive effect of time spent in a canton on national identification. In other words, non-citizens’ national identification flourishes best over time in those cantons with a receptive integration policy context. Conversely, this process of becoming closer over time to the nation that the immigrants live in appears to completely halt in those cantons with the most exclusive reception contexts. Relating our findings to the literature, we can say that “feeling welcome at arrival” (Van Hook et al. 2006) is certainly important, but it appears insufficient for immigrants to develop a feeling of attachment to Switzerland. Our findings appear to imply that the “warm handshake” and “cold shoulder” (Reeskens and Wright 2014) need time to be perceived by non-citizens. The same holds for integration policies, which matter only when they are actually perceived, which requires effective exposure to these policies over time. Future studies using more-direct measures for policy exposure and based on more-subtle research designs involving quasi-experiments or panel data are needed to substantiate or refute the causal claims developed in this chapter. Nevertheless, a recent study supports the argument that time and effective exposure to societal norms is needed for exclusive or inclusive reception contexts to be effective. This research shows that inclusive cantonal integration policies can prevent immigrants from emigrating again once they have been exposed to these policies, but they cannot attract them because immigrants are not more likely to migrate to inclusive cantons (Bennour, S. (2017). Do integration policies matter? An exploratory study on foreigners’ mobility and cantonal attractiveness in Switzerland. Presented at the IMISCOE Conference, Rotterdam, 27 June). In other words, integration policies in particular, and reception contexts more broadly, appear to be neither very effective prior to nor on arrival, but they affect immigrants’ attitudes after a certain period of exposure. Apart from future studies based on more-subtle research designs to prove or refute our preliminary findings, it would also be important to validate these findings using, for instance, more-recent data on integration policy and considering even-more-nuanced subnational units, such as municipalities. As we argued in this chapter, and in line with the literature documenting the path dependency of national integration regimes (Brubaker 1992; Favell 2001), cantonal integration and migration policies reflect path dependency, meaning fairly stable policy frameworks over time (Manatschal 2012; Sager and Thomann 2017). Consequently, we do not expect these policies to be completely different in 2014 when compared with 2008, which was the reference year of the index used in this chapter. Our robustness check using the narrower but more recent cantonal citizenship law index by Arrighi and Piccoli (2018) appears to confirm this expectation. Nevertheless, it would be interesting to replicate the analysis with more-recent cantonal integration policy data as soon as they are available. The second concern about the level of analysis appears more pertinent. As shown in this contribution, reception contexts vary strongly across Swiss cantons. However, the immediate surroundings people are exposed to on a daily basis are ultimately the local contexts. Given that local reception contexts can vary considerably within the same canton (e.g., rural versus urban municipalities), future research should scrutinize questions about immigrants’ national identification from a local perspective, considering the reception context of municipalities. Concerning the identity question, it would be interesting to further disentangle the general trend emerging from this study. Does the reception context affect the identity of female and male, refugees and highly skilled immigrants, children and adult non-citizens similarly, or are certain groups, for instance, particularly vulnerable groups, more “receptive” to the regional reception context? In a future study, it would also be revealing to connect this research more strongly to the complexity of the identity question. Although the focus of this study was on national identification with the country of destination, the additional robustness checks concerning homeland orientation revealed an interesting pattern. We observed contrasting individual profiles of people who identify with Switzerland (with typically close networks in Switzerland and high levels of satisfaction with the decision to move to Switzerland) and with their country of origin (with rather close social networks abroad and low levels of satisfaction with the decision to move to Switzerland). The cantonal reception context, in turn, did not yield a contrasting effect on homeland identification because it did not significantly alter the homeland identification either directly or over time. Further research is needed to understand whether inclusive cantonal reception contexts and integration policies are conducive to the development of dual-identities (“integration” according to Verkuyten and Martinovic 2012). Although the findings of our study are only a starting point, they clearly highlight the symbolic and catalytic nature and potential for inclusive reception contexts to foster national attachment and eventually social cohesion in contemporary immigration societies. Throughout this chapter, we use the terms immigrants and non-citizens interchangeably. Note that only one of the 5855 respondents included in our analysis is not a non-citizen (meaning the respondent indicated Swiss nationality), implying that de facto our results apply to non-citizen immigrants living in Switzerland. This popular initiative that aimed at limiting immigration by means of quotas was accepted by 50.33% of Swiss people and 17 cantons out of 26 in a national vote held on February 9, 2014. We consider the dependent variable – feelings of attachment to Switzerland – an integer variable because it is scaled on eight points, which we evaluate as sufficiently fine-grained to conduct such an analysis. We run alternative multilevel models using an ordinal response, which did not alter our results (models not reported but displayed in Appendix). Note: Unstandardized beta coefficients (standard error in parentheses); *p < 0.1; **p < 0.05; ***p < 0.01. Glarus and Appenzell Innerrhoden do not appear in the models because neither had any office runners from a conservative right party. Model 1 uses only random intercepts, whereas Model 2 uses random intercepts and slopes. Variables “GDP p.c.”, “Foreigners’ unemployment rate” and “Urbanity” were z-transformed prior to modelling. IPI = cantonal Integration Policy Index. Source: Migration-Mobility Survey 2016 (weighted results). The contextual variables “Urbanity”, “GDP p.c.”, “German-speaking canton”, “Yes share of “mass immigration” vote”, “Conservative right” have been made available by the Swiss Federal Statistical Office (SFSO) and “Foreigners’ unemployment rate” by the SECO. Arrighi, J.-T., & Piccoli, L. (2018). SWISSCIT: index on citizenship law in Swiss cantons. Neuchâtel: nccr – On the move. https://indicators.nccr-onthemove.ch/dans-quels-cantons-les-lois-sur-la-citoyennete-sont-elles-plus-inclusives/?lang=fr. Accessed 1 June 2018. Waisman, G., & Larsen, B. (2007) Do attitudes toward immigrants matter? Copenhagen Business School, Department of Economics Working Paper No. 11–2007. http://openarchive.cbs.dk/cbsweb/handle/10398/7587. Accessed 29 June 2018.